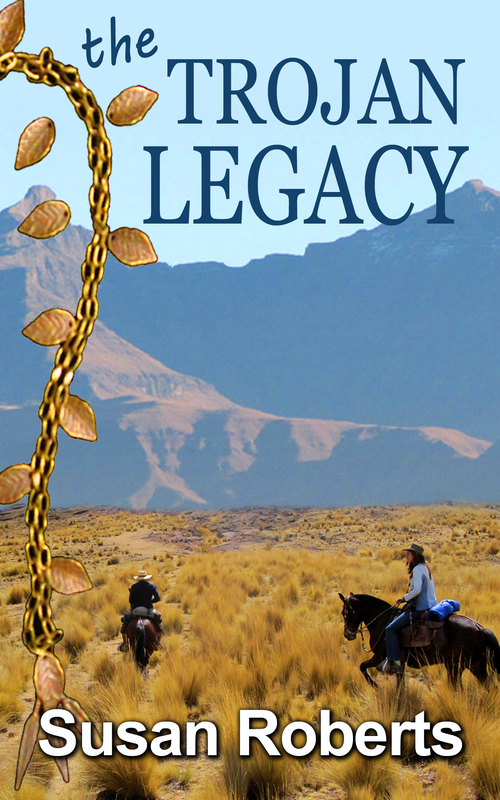 My latest romantic mystery novel The Trojan Legacy is currently free on Amazon for 5 days. That’s from today, Monday 18th July until midnight on Friday 22nd July, Pacific Daylight Time (PDT). After that it will return to its normal price. This eBook has only been on sale for a month, so this is the perfect opportunity to download it if you haven’t already read it. If you don’t have a Kindle, you can download a free kindle app to your device from any Amazon site, and read it on that. It’s a dual timeline story and takes place in modern-day Melbourne as well as 1962 South Africa. I hope you find it entertaining. The quickest way to download the book is to click on the image in the sidebar to the right, and it will take you to the book’s product page in your nearest Amazon store. If you prefer, you can click here instead, or here for the book’s product page at Amazon.com. As I usually say at times like this: if you enjoy the book, please tell everyone you know. In fact, if you really enjoy it, please consider leaving a review on Amazon or Goodreads so that more people will be able to see what you’ve said and that will hopefully swell future sales. But if you don’t enjoy reading it please send me a message on the contact form either here or on my website, telling me what you didn’t enjoy about the book. All constructive criticism will be taken on board and will help towards improving future novels. 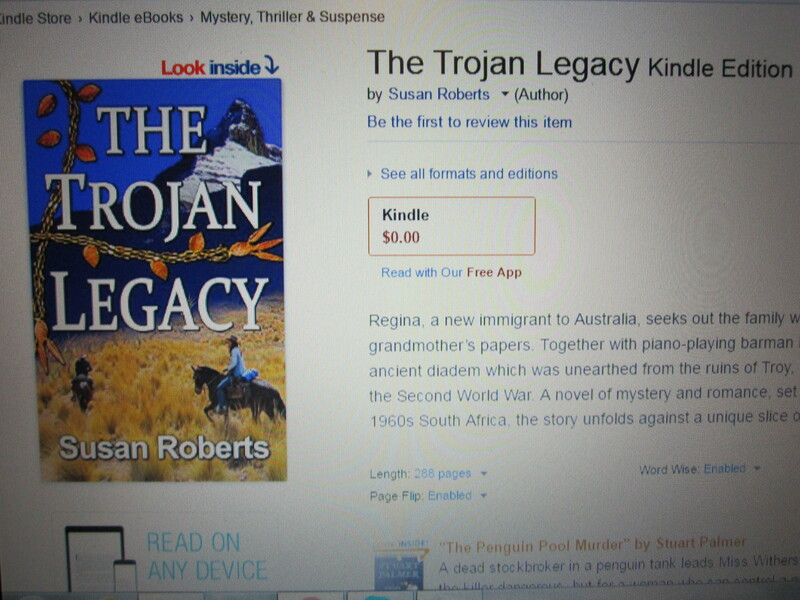 The Trojan Legacy – Now Live on Amazon! My latest novel has launched at last! 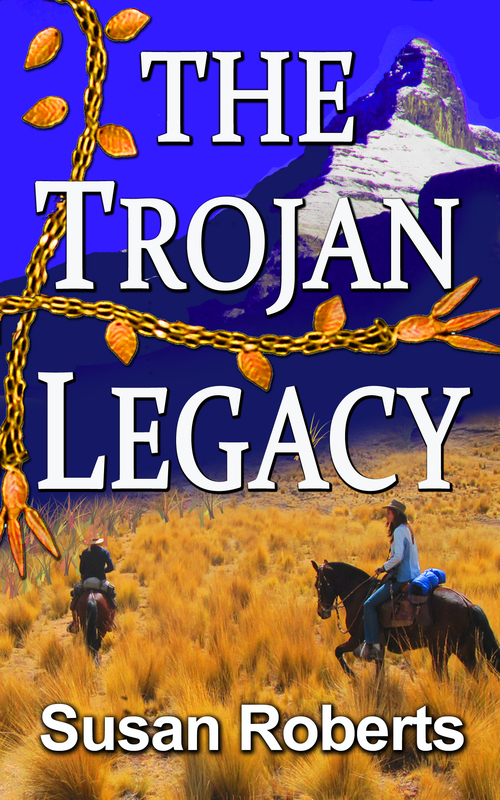 The Trojan Legacy is now on Amazon as an eBook, and you can find it here. This is a full-length novel, in the same genre of Romantic Mystery in which my first two full-length novels were written. The action takes place in two different countries, in two different time frames. Regina, a new immigrant to Australia, seeks out the family whose name she has found in her grandmother’s papers. Together with piano-playing barman Bobby, she unravels the history of an ancient diadem which was unearthed from the ruins of Troy, but which later disappeared at the end of the Second World War. A novel of mystery and romance, set in both modern-day Melbourne and 1960s South Africa, the story unfolds against a unique slice of South African history. Thank you to all those of you who helped me to choose between the two covers for this novel. It was (to misquote the words of Wellington after the Battle of Waterloo) a close-run thing. There were so many points in favour of both covers that I felt quite bad being able to choose only one. The cover I chose was (A) – the brighter, deeper blue background with the bigger lettering. With its vibrant colour, it has a resemblance to the cover of The Epidaurus Inheritance, and even though they are not part of a series, they are the same genre. The main deciding factor was because it really does stand out better in a thumbnail, which is what most Kindle readers will be looking at when (hopefully) choosing it as their next book to read. Visibility is the key in every sense, it seems. I have no doubt that the readers who enjoyed my previous books will enjoy this one as much – if not more so – but they just have to find it first. Unfortunately, since the last time I put a book up on Amazon, in October 2012, there are literally hundreds of thousands more books available than there used to be, and we’re all pushing and shoving for elbow room in the same arena. So if you happen to be one of those readers who enjoyed either The Epidaurus Inheritance or Benicio’s Bequest, why not pop over to Amazon.com, click on the cover to read the first two chapters, and see how you like it. You can even click on the book cover in the sidebar to your right and it’ll take you to my book’s product page in the Amazon store nearest you. Go on – you know you want to…! My historical romance novella is now free for the next five days on Amazon. 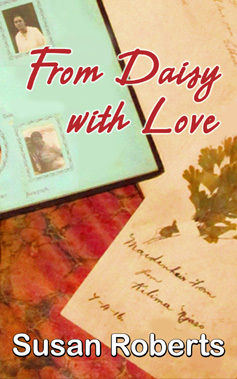 From Daisy with Love is a short read of approximately 25 000 words. 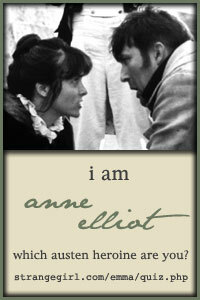 It is an old-fashioned love story set a hundred years ago in Africa, during the First World War. If you haven’t already read it, now is a good time because it’ll cost you nothing more than a minute while it downloads. If you don’t have a Kindle, you can download a free Kindle app to your computer from the same page before you download the book. Life is frustrating for eighteen year old Daisy, living with her sister Nellie in Durban in 1915 while their respective men are away fighting in the Great War. As a volunteer letter-writer at the local hospital, Daisy whiles away her hours of boredom by helping Peter, a young British soldier, to pick up the threads of his life after a serious injury. When her sister’s life falls apart and the letters from her own beloved Gilbert cease to arrive, Daisy must find the strength to pull her family through their loss and persevere through the war, so that she too can live a full life and leave a legacy to her descendants. As I’ve said with my previous novels that were free over the last two months, if you enjoy the read, please tell all your friends, and if you don’t enjoy it, please drop me a line via my contact form and let me know what you didn’t like. It all goes towards improving the next book. 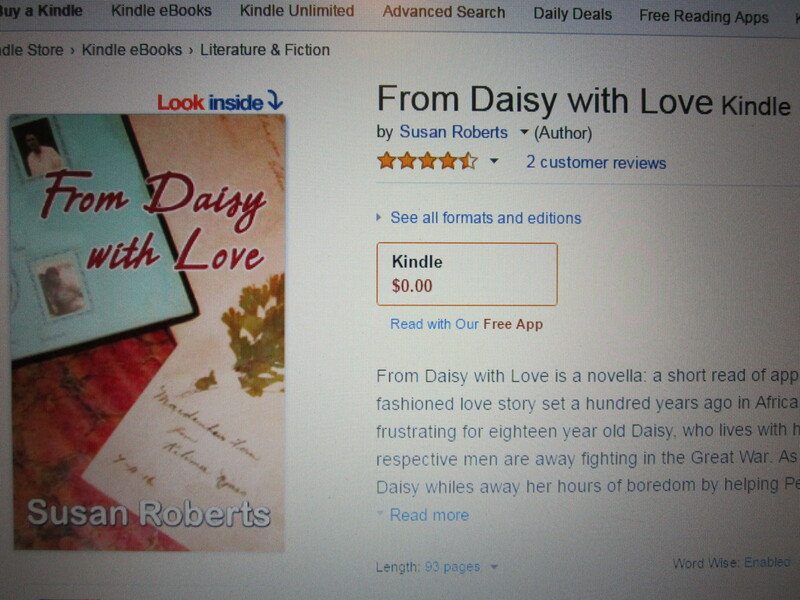 You can download From Daisy with Love here from Amazon.com, or here from the Amazon store that serves the country in which you live. It’s free right now, and will remain so until Friday night – 27th May – at midnight if you’re on the Pacific coast of the USA. If you are further east, you will have until later on Saturday – 7 am in England, 8 am in South Africa and around 4 pm in Australia. If you are anywhere else in the world, you can check your time zone against my new favourite tool, World Time Buddy. Which Book Cover Would You Choose? I’m very excited about the upcoming release of my new romantic mystery novel, and would like readers to help me choose which cover they prefer. An ancient diadem unearthed from the ruins of Troy disappears from a Berlin museum at the end of the Second World War. In 1962, archaeologists Ellen and Marcus track the diadem into the mountains of the Drakensberg, believing it was hidden there by a Nazi who stole it and escaped before the Nuremberg trials. South Africa’s apartheid government wants the diadem, but so does the underground political party known as the ANC. Ellen and Marcus have their own reasons for wanting the diadem, but Inspector Uys has a darker purpose and will stop at nothing to prevent Nelson Mandela and the ANC from taking control of the country. Two generations later an Australian bartender and a South African travel agent put together the disjointed clues from their respective grandparents, and set off on a trail of their own in search of answers. These are the two covers: Let’s call them A and B. Which do you think is more eye-catching? Bear in mind this is for an ebook to be sold on Amazon, and the image can be quite small when viewed on some reading devices. It’s not part of a series, but it is the same genre as the first and third books in the sidebar on the right. Please let me know your thoughts in the comments below. Thank you for your time – your input will be greatly appreciated! 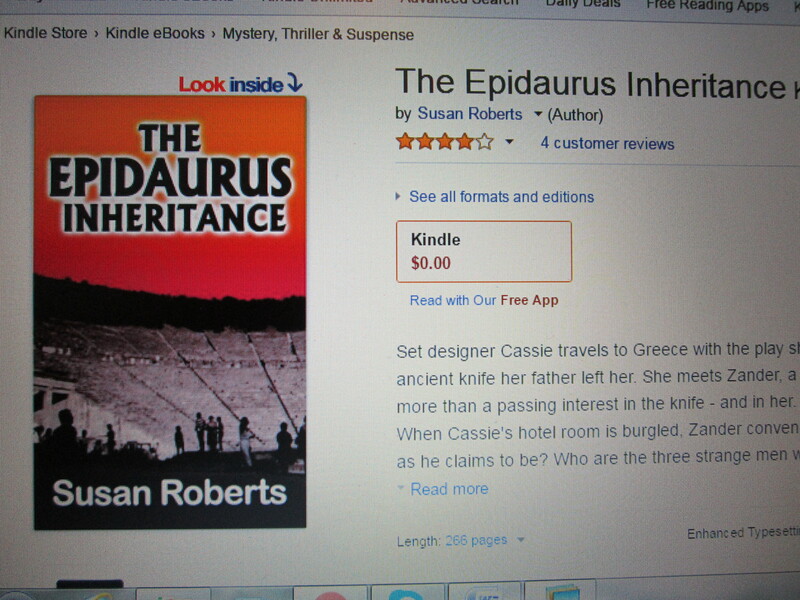 My romantic mystery novel The Epidaurus Inheritance is currently free on Amazon for 5 days. That’s from today, Monday 25th April until midnight on Friday 29th April, Pacific Daylight Time (PDT). After that it will return to its original price of $2.99. If you haven’t already read this book, now is a good time to download it because it’ll cost you absolutely nothing except the time to read it. Don’t despair if you don’t have a kindle, because you can download a free kindle app to your device from any Amazon site, and read it on that. What could be simpler? 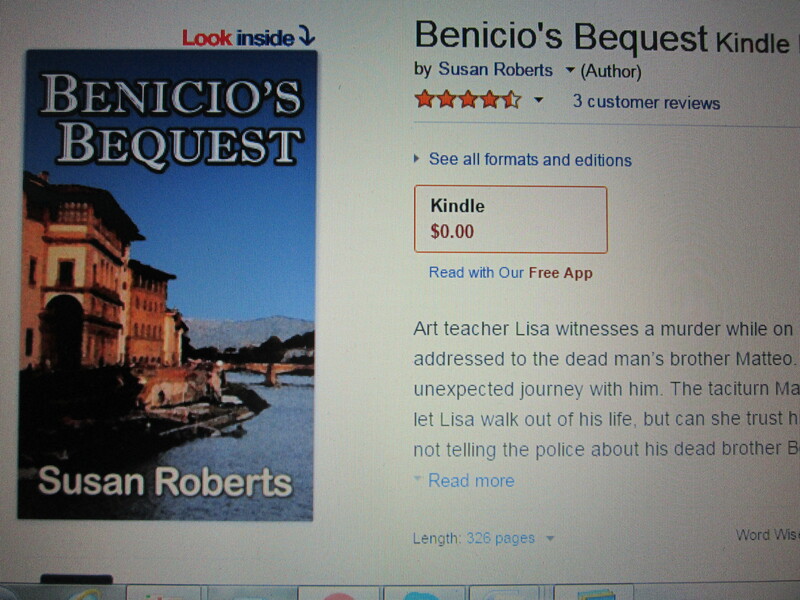 As I said last month when one of my other books – Benicio’s Bequest – was up for free, I know that romantic mysteries are not everyone’s cup of tea, but I like writing them because I’ve always enjoyed reading them. I don’t regard mine as regular romances, because there’s always a mystery to solve along the way, usually with a good dollop of history, art and possibly a smattering of the classics thrown in, and this novel is no exception. The Epidaurus Inheritance is set in Greece, one of my favourite places in the world; a place which, for me, has always been steeped in history, drama and mythology, to say nothing of being the birthplace of theatre as we know it. In fact, that’s where this novel starts – at a modern performance of an ancient Greek play. Cassie is the set designer for a South African production of a play which is being staged at one of the oldest Greek theatres in the world – the enormous open-air stone structure that is Epidaurus – as part of the annual summer festival. For the design of a ceremonial knife used in the play, Cassie has copied the design of an ancient knife she inherited from her Greek father, which was handed down through the generations before him. Cassie has always been fascinated by the knife and is hoping to find out more about it now that she is in Greece. Unfortunately for Cassie, she is not the only one interested in it. In addition to Zander, the antiquities investigator who starts badgering her about the original knife, a group of silent men who are part of an obscure religious order always seem to turn up in the same place as Cassie at the wrong time. Before long there is a break-in at Cassie’s hotel and she no longer knows who to trust. Cassie’s quest takes her to Athens, Galaxidi, Delphi and the island of Poros, and along the way she is dogged by knife-wielding lunatics, murder, betrayal, kidnapping and fire. On the lighter side, she finds love, ancient artworks and an archaeological secret that she thought existed only in her dreams. 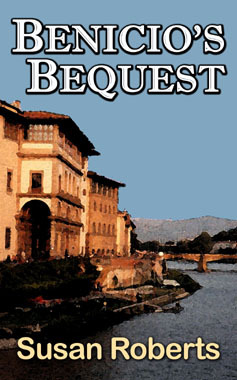 To those of you who downloaded last month’s book – Benicio’s Bequest – I hope you enjoyed it enough to want to try this one as well. Thank you to those of you who left reviews on Amazon and Goodreads. Your kind words are much appreciated. 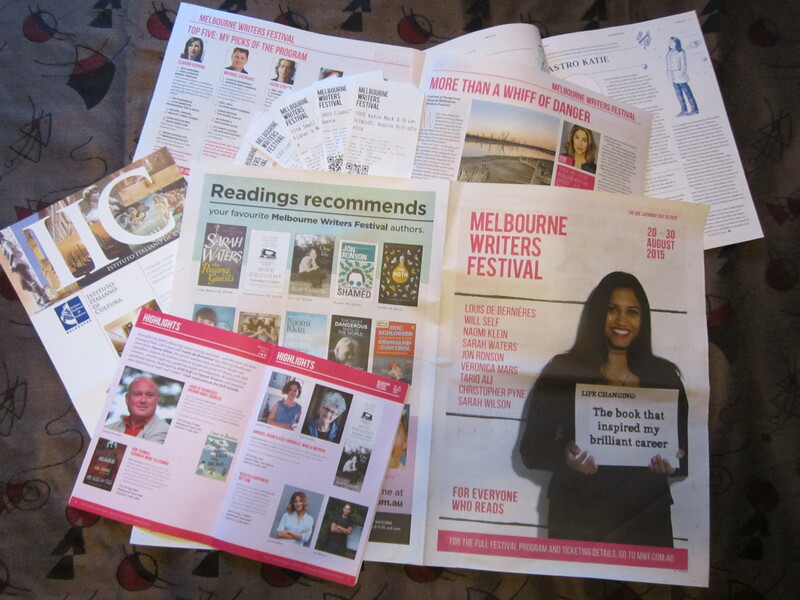 As I always say – if you enjoy the read please tell everyone you know, but if you don’t enjoy it please send me a message on the contact form either here or on my website, telling me what you didn’t like. All constructive criticism will go towards improving future novels. And if you really enjoyed it, please consider leaving a review on Amazon or Goodreads. Or both. 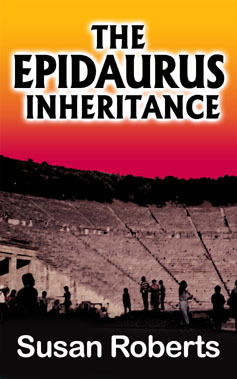 You can download The Epidaurus Inheritance here from Amazon.com, or here from the Amazon store nearest to you, any time between now and Friday night in the USA. If you are elsewhere in the world, you’ll still have until later on Saturday to download it: 7 am in the UK, 8 am in South Africa and 4 pm in the eastern part of Australia. If you are anywhere else, you can check your time zone against Pacific Daylight Time with world time buddy. Here’s hoping you have fun on your whirlwind reading trip through Greece…!